That's one big, black blemish on the Sun today! Rarely have we been witness to such an enormous sunspot. Lifting the #14 welder's glass to my eyes this morning I about jumped back and bumped into the garage. Properly shielded, it was very easy to see with the naked eye. Unlike some other naked eye sunspots, this one showed structure. The eastern end was darker, the western half grayer and more extended. Through a small telescope, the mix of dark umbras scattered amid weirdly sculpted penumbral "islands" was incredible to see. Photographs like the one above are wonderful documents, but witnessing this beautiful complex magnetic mess with your own eyes is another experience altogether. Region 2192 continues to grow and size and complexity and is now the largest sunspot group of solar cycle 24 which began in 2009 – more than five years ago! 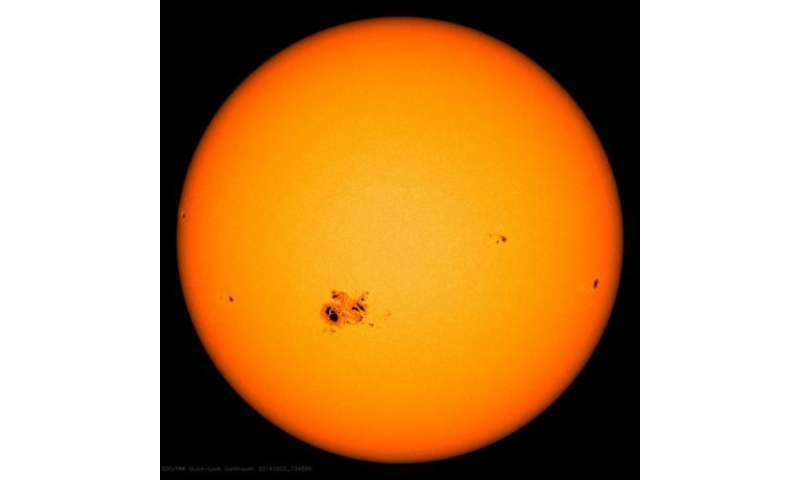 Every sunspot marks a region on the Sun's shiny outer skin called the photosphere where magnetic energy is concentrated. Strong magnetic fields within a sunspot group quell the turbulent churning of the photosphere, chilling the region by several thousand degrees. 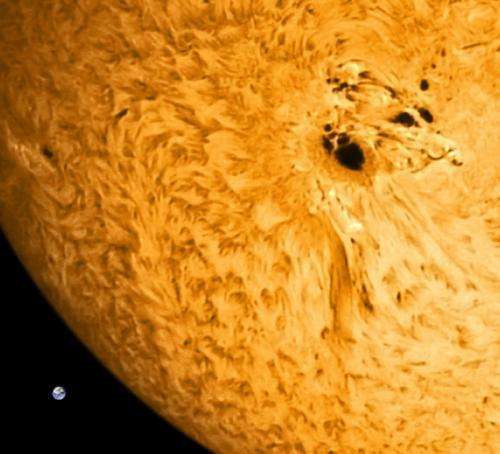 Sunspots appear dark against the Sun's blazing disk because they're cooler. Cooler meaning 8,000 F instead of 11,000 F, so yes, they're still VERY hot. Energy stored in sunspots' twisted magnetic fields can suddenly be released in violent, explosions called solar flares. Billions of tons of solar plasma – the sizzling mix of protons and electrons that composes the Sun – are heated to millions of degrees during the explosion and rapidly accelerated into space. Radiation from radio waves to X-rays and gamma rays fans out at the speed of light. Fortunately for us, our atmosphere and planetary magnetic field protect us from most of what flares can fling our way. But as the Sun rotates this monster into our line of sight, possibilities for Earth-directed flares and coronal mass ejections increase as do geomagnetic storms, the bringer of auroras. Already in the past 48 hours, the spot has dished out seven M-class flares and a powerful X-1 flare even before it has fully come into view. There's more to come – Region 2192 harbors an unstable beta-gamma-delta magnetic field ripe for additional flaring including more of the X-class variety. There's no doubt now that this behemoth will stick around to add a whole new dimension to tomorrow's partial solar eclipse. I can't wait to see the Moon's black curve approach and at least partially occult the group from view. If you're interested in getting some one-of-a-kind pictures of the scene, please see our own Dave Dickinson's excellent guide on photographing the partial eclipse. Watch as Region 2192 crackles with energy and flares as seen in far ultraviolet light with NASA’s Solar Dynamics Observatory. While we're on the Moon, early morning risers had the pleasure of its company just one day before New Moon and solar eclipse. I was out watching the Orionid meteor shower. While not rich like the Perseids or Geminids I managed to catch a few including a few lucky shots with the camera. The shower has peaked but will still be active the remainder of the week if you're inclined to take a look. And I can't resist. How about one last sweet close-up photo of sunspot group 2192? I have a feeling you won't mind. Fantastic! This explains a phenomena I witnessed in 1972 and never found an explanation for. It was a foggy morning. I was riding a bus to my first major job, heading north towards downtown Louisville. Looking out the bus window, I saw a fairly significant black spot on the sun for a duration of about 20 minutes as the fog persisted. I never knew what the hell I was seeing, or who to even ask about it. A few decades later I learned about Mercury and Venus transits of the sun, but none such had occurred that year. A visible Mercury transit DID occur in 1973, but a Mercury transit is also much smaller than what I saw. Best of all, now I can finally ditch the meds and get a real nights sleep! I guess I oughta also ditch the mistaken notion that it was a cosmic message - I thought if I ever had a son, I was supposed to name him "Spot".